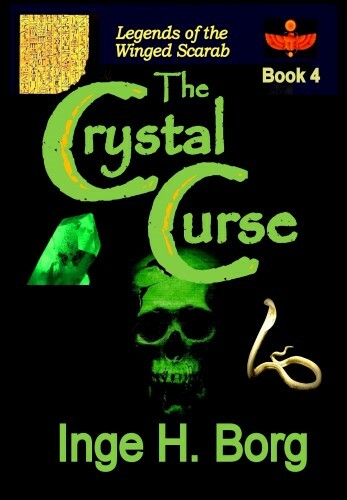 The Crystal Curse, as the previous three books of the series, was first published with Amazon-KDP, as well as on Smashwords (slightly different formatting required). I also designed and published this on CreateSpace as a print book. A couple of weeks ago, I unpublished with Smashwords and placed the entire series into KDP SELECT. Now, rhe books can be "borrowed" under the KindleUnlimited program. I use a couple of Beta readers who have a degree in English; several reviewers will also send me a private note when they find "echos," or typos which are then immediately remedied. The fourth book in a series does present a challenge; how much background does one insert and still keep the story fresh? Or should one simply expect the reader to be acquainted with the preceding volumes? As much as I could, I tried to make each volume a stand-alone novel. Of course, a lot of innuendo and insight would be missed by only reading one of the books. That said, The Crystal Curse can still stand alone. Pitted against them are Egyptologist Naunet Wilkins, her scientist husband Jonathan, and their friends from Borg’s preceding volumes of the Legends of the Winged Scarab. They are kidnapped by the piratical owner of a converted ghost ship carrying a ton of ancient golden tablets bartered away by the former Cairo Museum director Jabari El-Masri. He and Naunet are forced to recreate their supposedly lost previous translations of the First Dynasty slates. At a conference on Malta, the eight super-rich power mongers hammer out their diabolical agenda. When El-Masri tries to save his family first by lying about wondrous crystals to be found in the Ideon Cave on Crete, and then by admitting they only grow deep within the Lost Labyrinth of Egypt, the avaricious eight set their sights on mining them. But El-Hanash, the Crystal Snake, coils for those who dare defy the Crystal Curse. Who will live? And who will die? Naunet and Jonathan Wilkins are again kidnapped by the piratical owner of a ghost ship carrying a ton of ancient golden tablets. Former Cairo Museum director Jabari El-Masri lures them into the Lost Labyrinth of Egypt where El-Hanash, the Crystal Snake, coils for those who dare defy the Crystal Curse.